Well it actually didn’t start with cookies.. I started my “baking days” with cake pops. 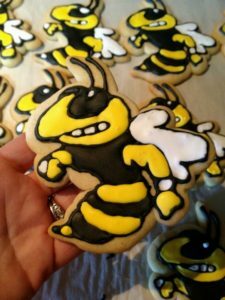 I discovered Angie of Bakerella and fell in love. I just KNEW I wanted to make cake pops like her. Now I’m going to let you in on a little known secret, I actually don’t like baking. It’s a lot of work and a big mess. Now don’t get me wrong, I’ll eat the crap out of baked goods – but actually baking…will you come do it for me? 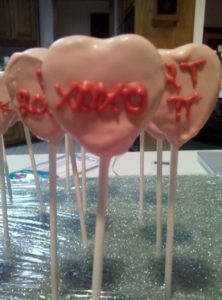 As a creative, I really enjoy the creating and artistic part of cake pops/cookies/etc. So I got out my boxed cake mix and canned icing (no judging) and “whipped up” some cake dough balls. The first time I made them for a few friends and they were plain and simple – and delicious. I kept having issue with my chocolate – it would crack, or my cake pop would fall off the stick…you name it, it happened to me. Now lets take a look at some of my “firsts.” Promise me, you won’t laugh! 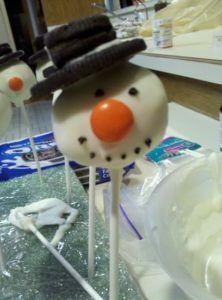 How could I not attempt the super cute Christmas cake pops? 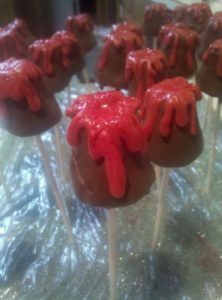 I had a friend ask my to make volcano cake pops for her son’s party – “Sure! I can do that!” Fake it until you make it, right? 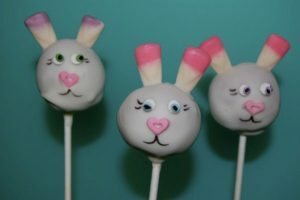 And then I got brave and took orders for Easter cake pops! 12 dozen to be exact. This was the end of cake pops for me. 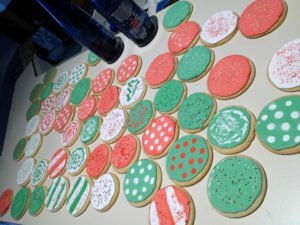 I used to cringe looking back at some of my first cookie/baking creations. Now, I look back and admire how much I have grown.  As a former teacher, I believe that everyone should be forever learners – no matter what aspect of life. With cookies, I hope to always learn and grow. My work is not perfect and I can always find something to improve upon. New ideas and techniques come out and I jump at a chance to try them out! 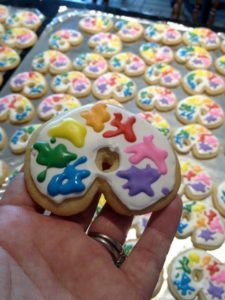 Just like with cake pops, there are numerous bloggers that influenced my decision to give cookies a try. 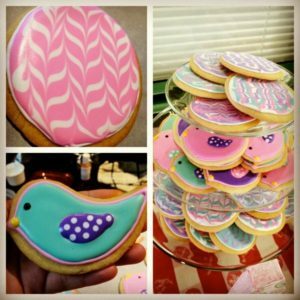 The very first cookie blog that I followed was Bridget from Bake@350. I fell in love with her friendly personality, curly hair and the fact that she lives in Texas! Up next, the queen of cookies of course – Callye of Sweet Sugarbelle. She makes it look SO easy. Her blog is FULL of knowledge for beginners. And guess what? She’s from Texas too. #Texasforthewin. A few others that I obsessed over are: Lila Loa, Bearfoot Baker, Clough’d 9 Cookies, and Sweetopia. 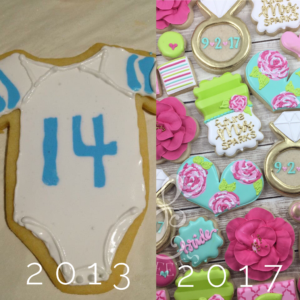 My best friend was getting married and I wanted to make cookies for her wedding favors. 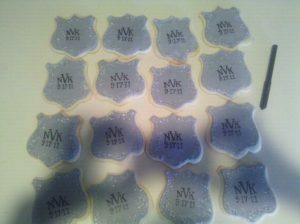 Both her and her husband are police officers so I decided to do a badge shape with their initials and wedding date. 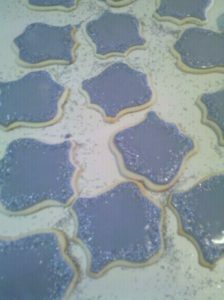 I wanted to match their badge shape, so I made my very first cookie cutter. I used a sheet of metal, cut a 1″ strip and bent it to shape. Now let me add in, this was life before the 3d printed custom cutter craze. I still have this cutter (and a few other that I made) and I love it! I used sprinkles around the edge (so fancy!) and an edible food marker for the initials and date. Those letters were freehanded, folks! No kopy kake or pico yet. 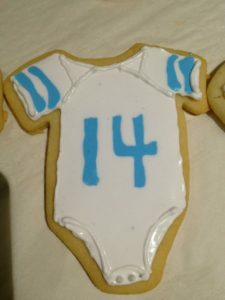 After my Christmas cookies, I was feeling pretty confident. 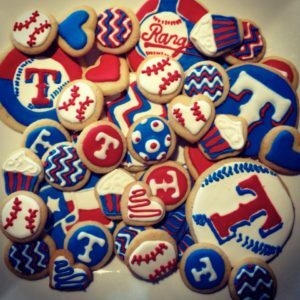 Our secretary at school was my biggest cheerleader and she was also my official first “order.” She wanted baseball themed baby shower cookies for her first (and most loved) grandson. I made baseball cake pops and onesie jerseys. Fun fact: These cookies never dried. I was not feeling so confident after those. 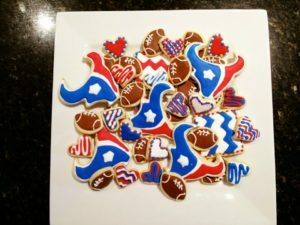 As time went on, I came up with more excuses to make cookies and practice. I started the tradition of making cookies to hand out at “Meet the Teacher” night at our school. Baby showers, birthday parties, baseball games, you name it! As you can see, with each set there is clear progress. My biggest piece of advice for anyone starting out is just to practice. The more you do, the better you’ll get! Don’t ever be ashamed of where you started! Previous Post Big Things Are Happening Over Here!